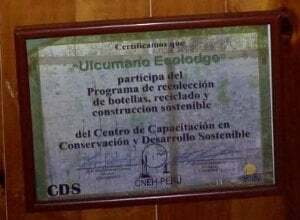 Ulcumano Ecolodge, PeruThis Ecoclub Ecolodge™ Ecolabel Desktop Audit Report was prepared by the Ecoclub Ecolodge™ Ecolabel Administrator based on material provided by the Proprietor of Ulcumano Ecolodge. 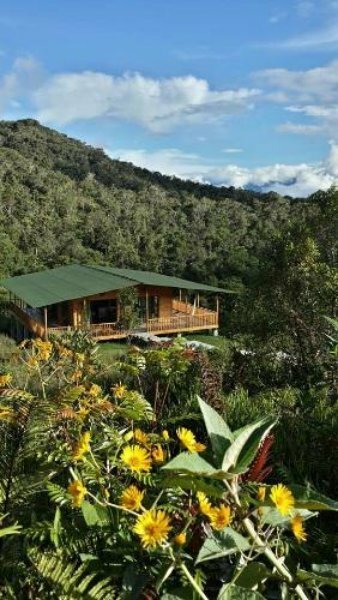 The Ecoclub Ecolodge™ Ecolabel Auditor has reviewed the report and is satisfied that Ulcumano Ecolodge meets the requirements for the award of the Ecoclub Ecolodge™ Ecolabel. 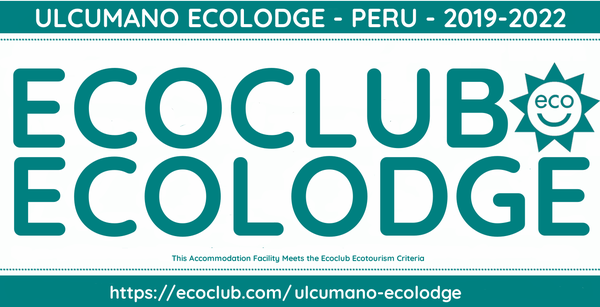 The report was approved on 31 March 2019 and Ulcumano Ecolodge is hereby accepted and certified as an Ecoclub Ecolodge™ through 31 March 2022. 0.6. Since when has the Property been under the current ownership? The land was bought in 2007. 0.7. 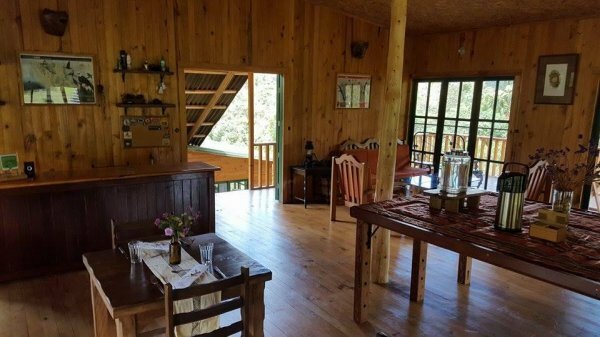 Accommodation Type & Size: Ecolodge, 8 Rooms, 19 Beds, 98 hectares total land area, 480 m2 total building footprint. 1.1. Property Siting: The land had the perfect combination between nature and distance from the town, no too far to reduce carbon emissions for transport to get to the property, not too close to have noise or light pollution close to the project. The place for building the infrastructure, was selected doing an evaluation of the impact on the place, 1.5 hectares with introduced grassland for cattle (done by the first owner from whom I bought the land), so I chose to build on only that already impacted area. Photo 1.1: View of the dining room and main building and kitchen (at left), you can see the photovoltaic system and chimney (of the wood stove for heating the common area), also you can see the east wall with sun at morning to demonstrate the building orientation for maximize the sunlight and reduce energy consume. 1.2. 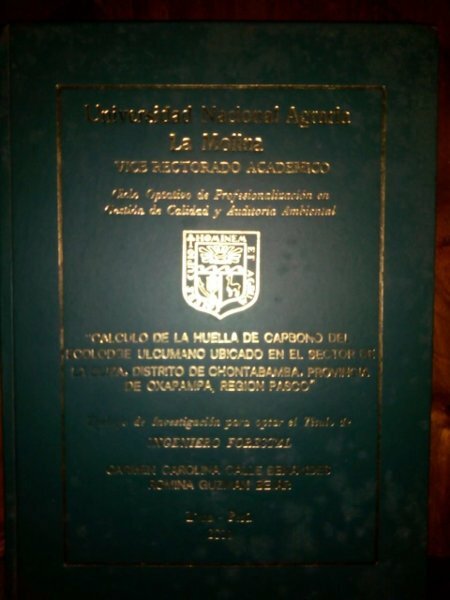 Nearest village or town, population and distance from the property: Oxapampa, 10.5 km, population: c. 15,000. 1.3. Property Design: Built using local design,and local wood from reforestations. The building orientation is East-West, so that we have more natural light hours and reduce energy consumption. The roofs were painted green roofs to blend in with the environment. All construction is built on pillars so that we do not impact directly on the soil. cabins purpose is to provide comfort during this experience. 1.4 Property Construction: Built by local carpenters, entirely built by hand, no machines were used, only manual tools to minimize the noise. We only used concrete for the pillars of the cabins to level the construction with the surface of the place. We only built on the area with no vegetation. Now the original vegetation is totally recovered. You cannot no longer see the cabins from the dining room as (compare photos below). 1.5. Property Renovation & Maintenance: No renovation has been undertaken so far. Complete maintenance is done each year and a monthly maintenance for cabins and pipes. 1.6. Compliance with Zoning Requirements: Oxapampa province is a rural area, so there is no zoning requirements by the municipality, but I designed the ecolodge according to the landscape. Photo 1.6: All the cabins are built and located on a level curve. 1.7. 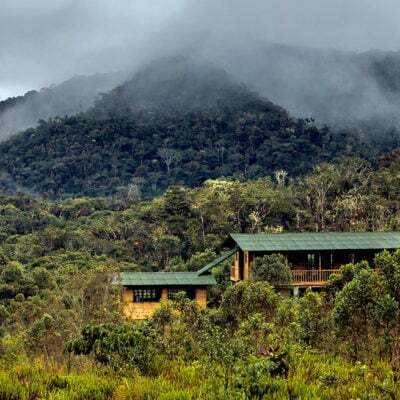 Biodiversity Conservation: We have a conservation area of 49 hectares, the main purpose of the ecolodge is to generate income to conserve the cloud forest, and we work hard on it, using ecotourism as a tool of conservation. 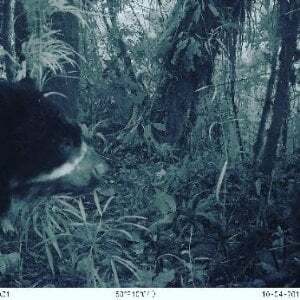 Photo 1.7: Spectacled bear picture taken by one of our camera traps. Our conservation efforts include research and zoning, so there are big areas with no disturbance for animals. 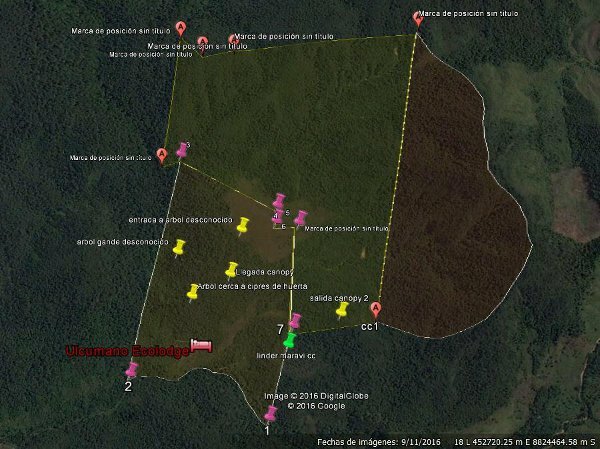 We are working with neighbours to conserve their forest so the animals have a biological corridor for living and feeding. 1.8. Greenhouse gas emissions: We only we have water heaters with propane, we change the propane tanks (10kg) for shower heaters once every 4 months. For cooking we use two 10 kg propane tanks each month. We monitor consumption with excel tables. 1.9. Environmentally preferable purchasing: We buy everything with no packaging, we try to buy all fresh ingredients or with no packages, or with a recyclable package like glass and paper. 1.10. Local & organic products: We buy everything local, from local producers ("kilometre zero" concept). In our area there are no certified organic products so we buy natural products. 1.11. Pesticide avoidance: We do not use any type of pesticides. 1.12: Environmental Management System: We recycle and reuse, we manage black waters with a biodigestor, and grey waters with a biofilter, using biodegradable cleaning stuff. 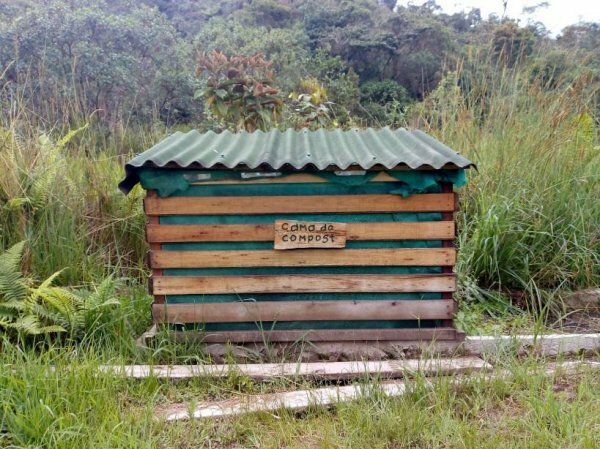 Composting waste, and using the minimum of motorized vehicles (we have one gasoline car with propane adaptation to reduce emissions. We have a no noise policy, no pets and no wild fauna capture to reduce our impact to local wild fauna. No introduced plants, only native plants for landscape. 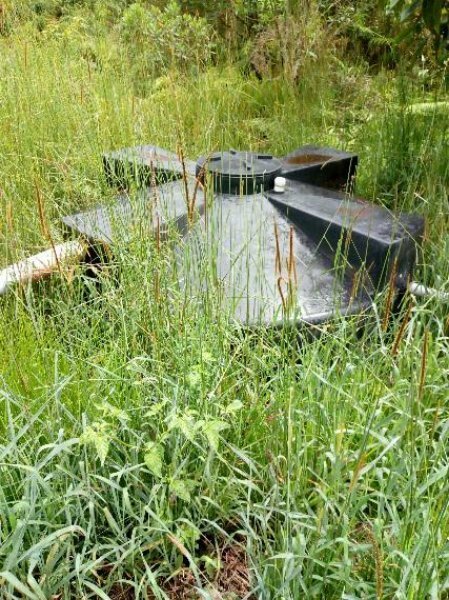 Photo 1.12.a: Biodigestor device with bacteria who help process the black waters from toilets (only toilets come to this device by a separated pipe). 1.13: Appliances/Devices Maintenance: We do not have devices that need maintenance. 1.14. Lighting: 100% solar power, LED bulbs, movement sensors for common areas like bathrooms, all cabins have their own photovoltaic system just for lightning, and 12v for charging batteries. The dining room has a bigger power bank for 220 volts for charging 220 volts devices. 1.15. 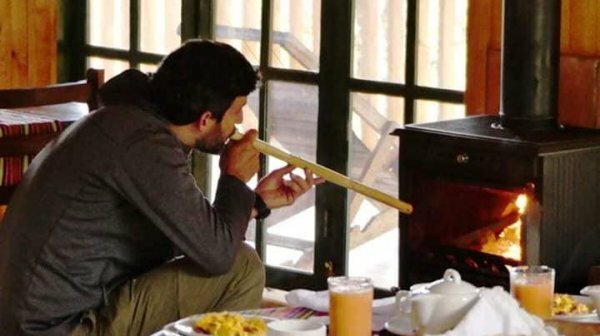 Heating: Mechanic (blankets on beds), wood stove in dining room, wood provided by leftovers of the main construction when we built the ecolodge and branch pruning form landscape management. 1.16. Cooling: No need for a cooling system. At night temperature drops to 10°C, during the day we open all windows. Photo 1.16: The design of the cabins are with big windows and screens, so the guests can regulate the temperature by opening or closing them. 1.17. Cleaning: We use natural products like vinegar, lemon, and biodegradable cleaning stuff. 1.18. Water Management: We take water from a spring on the mountains of the conservation area of our property. We do not treat the water, we just filter it with mechanical means and then take it by pipes to the main tank of our water system. 1.19. Rainwater & grey water recycling: Grey water is treated with a bio filter. All grey water runs in separate pipes from blackwater. 1.20. Irrigation: No irrigation. We use rain as we are in the forest. 1.21. Composting: We compost kitchen and dining room leftovers. 1.22. Pool Management: No pool. 1.23. Species used in outdoor planting: All native landscape. 1.24. Paper products: We do not use paper, just for toilet and paper towel (FSC certified) for common bathrooms. 1.25. Durable goods: All the dishes and kitchen or dining room goods are made of glass or porcelain. Photo 1.25: 100% of the kitchen goods are non-disposable, and we ask guests not to bring disposable items in order to reduce the waste and plastic consume. 1.26. Beverages provision: Filtered water from our own source, and local fruit juices. 1.27. 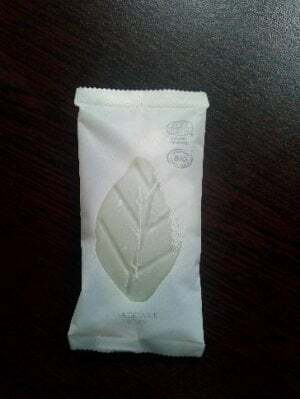 Detergents & Toiletries: Biodegradable. 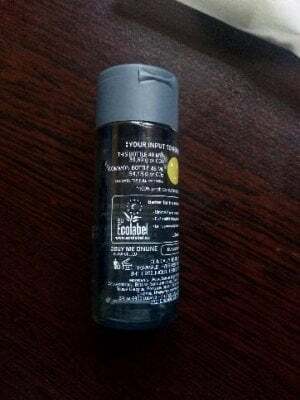 Photo 1.27: We give the guests biodegradable soap and shampoo with ecolabel, and not each day, we just bring a new one to them when the first one is finished, so we reduce the consumption of it too. 1.28. Used Textiles & furniture: We reuse furniture. Photo 1.28: The main table is a recycled door from a house to be demolish, we use used furniture like the orange chairs behind the table, when we need a new furniture we look for places who are not using them, and we restore it and use it. 1.29. Cooking: We offer slow food, under "kilometre cero" (Zero Kilometre) concept, natural ingredients. The chef (my wife) manages the kitchen with HCCP norms to keep clean and save everything at the kitchen. All food is Peruvian style and local style, with local products - we do not import anything. 1.30. 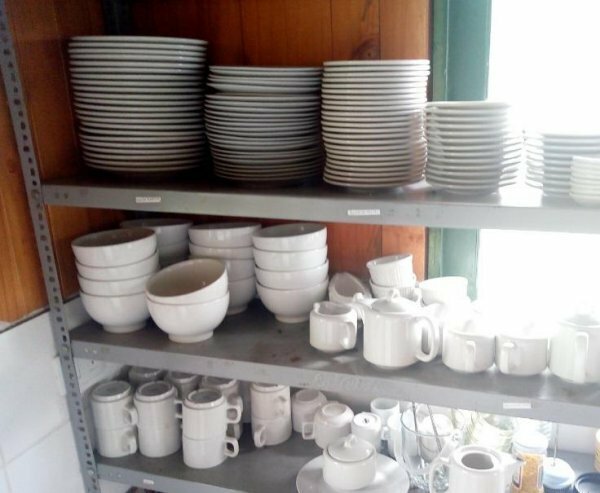 Waste Prevention: One menu per day programed for the number of guests that we have that day only, so as to reduce leftovers and non-used stock. We buy everything at the local market with disposable items. 1.31. Waste sorting & recycling: We separate reusable waste, we participate in the municipality's recycling and waste program. We weight the waste and record it on an excel table. Photo 1.31: Certificate of participation in recycling programme. 1.32. Insect, pest control: No pests until now. 1.33. Noise Protection: We do not use any machine. Low ambient music for dining room, we ask guests to avoid any kind of noise. 1.34. Smoking Policy: Smoke-free place. 1.35. Environmental Transport Use and/or Promotion: Propane is used for fuel in our car to reduce emissions. All our tour operations are in the same area so we do not use the car for transport to a tourist activity, just for logistics, every 3 days. 1.36. Accessibilityy by public transport: No public transport to our place, we are in the jungle. 1.37. 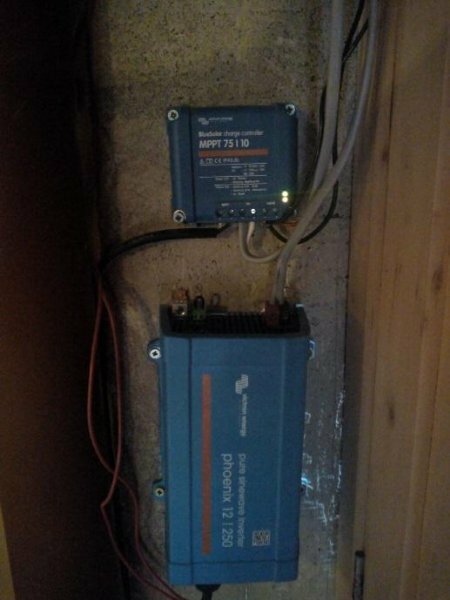 Consumption Monitoring: We monitore water and energy consumption with measuring devices and excel tables. We have two water measure devices, one in the kitchen and one for the main tanks. This way we know how much water we are using in the kitchen and how much water the guests are using in the cabins. 1.38. Staff Training: We train the staff in environmental management, including waste, water use, energy use, cleaning, wilderness first aid, and guiding techniques. Photo 1.38: Wilderness First Aid course for staff, this one of the training skills we give. 1.40 Anything else you would like to mention in this section? 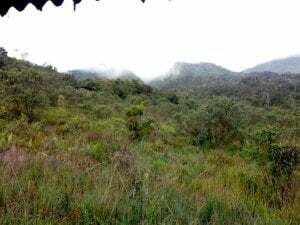 We try to give the maximum of information to our guests, about water, energy, waste, about the importance of forest conservation and the importance about the cloud forest. 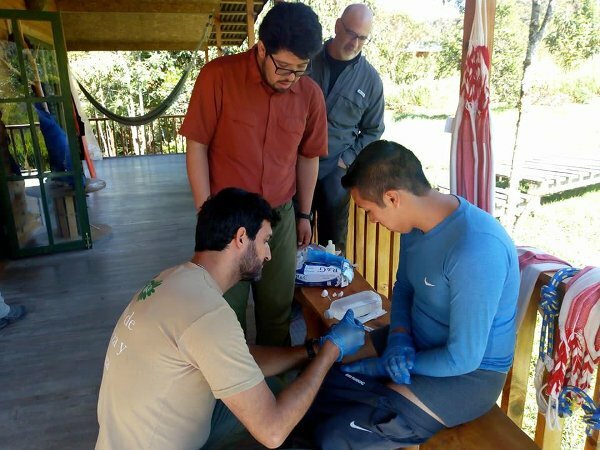 We give them information about how part of the money they pay for their stay is going to forest conservation, environmental education to the local school, reforestation with native plants. Each guest plants one tree at the end of their stay, so we balance the carbon emission of the operation during the stay and transport. 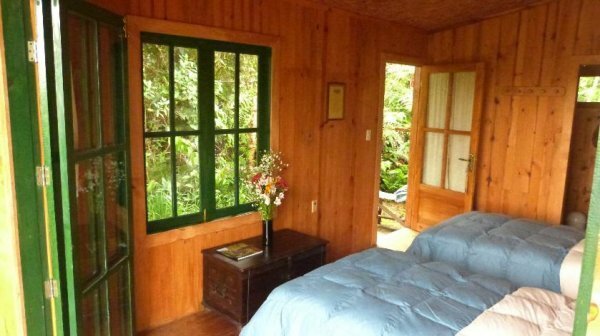 A study was undertaken about our carbon footprint and we are working on lowering it with the reforestation.The main idea for us is to educate guests about the importance of the cloud forest and it´s conservation and to explain how they are supporting conservation efforts with their stay at our ecolodge. Photo 1.40: Young guests planting one tree each. 2.1. Complying with all local health and safety regulations? Yes. 2.2. Access for all? 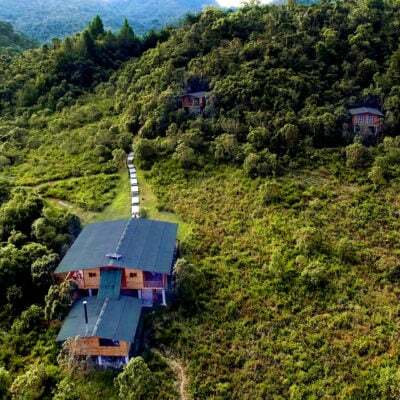 Everyone can stay at the ecolodge. 2.3. Respect local communal and indigenous rights? There are no indigenous people close the ecolodge. 2.4. Decent work conditions? Yes, we have a policy of the same treatment for all guests and staff. 2.5. Equal opportunity? Yes, anyone can come with us to work. 2.9. Paid Leave? Our employment contracts cover only days with guests. We do not work all days, just when we have guests, so the staff work in their houses when they do not work with us. 2.10. Maternity Leave? Our employees do not have babies (they have adult children). We are on a small business national regime and we are not obligated to offer maternity leave, because we do not work all days and all year , but only when we have guests. 2.11. Paternity Leave? As above. 2.14. What is the average wage, the highest wage, and the lowest wage? The national wage per month is around USD 320 (10 usd per day / 8 hour day). We pay USD 30 per day/worked, around USD 1,000 per month plus accommodation and food. 2.15. Average and maximum working day, and work hours per week: 12 hours per day. Normally we do not have guests more than 4 days in a row. There is a rest break of 3 hours between the first and second round. 2.16. Do you employ your staff all year round? We employ only when we have guests. They are paid by day worked. In 2018 we worked only around 100 days. 2.17. Do you employ immigrants? Are they permanent or temporary employees? Are they offered the same remuneration & benefits? 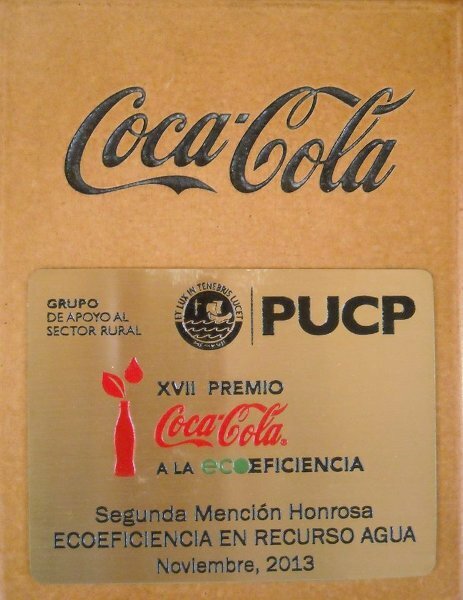 Yes, temporary, when we have guests, they have the same remuneration and benefits as Peruvian workers and the owners. 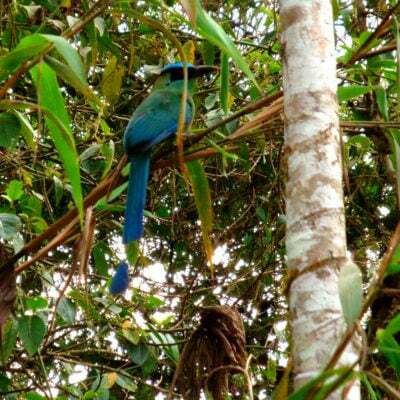 They are residents in Peru and they live in Oxapampa town. 2.18. Do you employ trainees? Not yet. 2.19. Do you use volunteers? Please explain what tasks they are given? Yes, sometimes. The tasks are what they want to learn or to do, help with guiding, housekeeping, maintenance. The idea is that they work with us, and they have a learning component like language, working skills. 2.20. Do you offer concessions to elderly visitors, students, young visitors, or nationals? 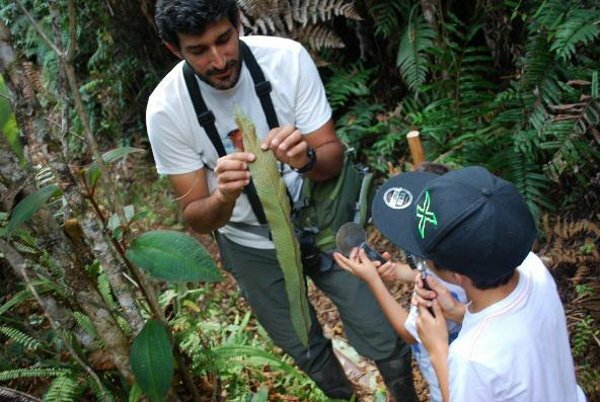 Yes, we offer facilities for students who want to do their thesis or investigations on our forest, we give them accommodation, food and logistics. So far we have hosted around 20 students, 19 peruvian, 1 british, USA, Uruguay. 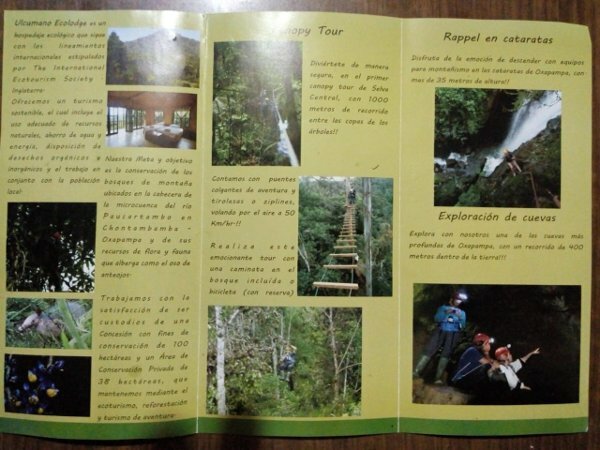 They were hosted free of charge, they helped on the Ecolodge or gave information as pictures, etc. 2.21. What measures are in place to protect the local (or the indigenous) population from some adverse impacts of tourism? There are no indigenous people close to the property. The nearest indigenous community is no longer out of the influence of the occidental culture, they live like people in the town. So our visits do not influence their life style. They are in contact with town people and tourists for over 30 years, the same is true for the local community. 2.22. Do you undertake any injustice reduction initiatives or does your operation contribute to injustice reduction? We work with a local school which includes kids with no economic resources. 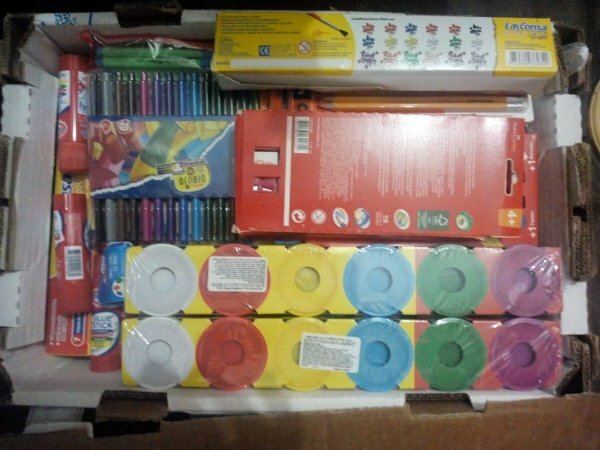 With the help of our guests and part of our incomes we buy and donate school tools and books. 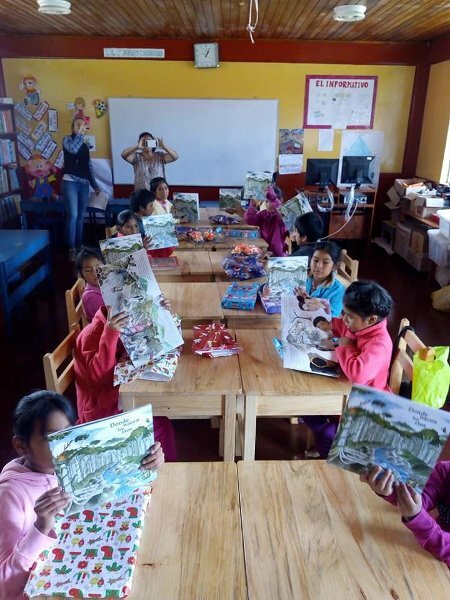 Photo 2.22.a: We work together with an local ONG and we help them to produce and distribute environmental education books about forest and water, this is the school where we work. 2.26. If owned by a person or family, since when has the person or the family been residing in the area, and for how many months each year? Throughout their lifetime. 2.27. How are decisions taken and by whom? They are taken as a family, and by priorities. Between me and my wife, we decide what to do, we do not have a procedure, we just make a list of improvement needed at the Ecolodge and services and then decide. 2.28. Who has access to the Property’s facilities and its land and for what uses? Only owners and staff for work and maintenance. 2.29. Do you have an Anti-Slavery and Human Trafficking Policy? We do not have any text on the wall, we are just against those practices. 2.30. Policy towards Animals? We have no captive wildlife and do not accept pets at the ecolodge. 2.31. Anything else you would like to mention in this section? We do not allow pets at the ecolodge because they can bring diseases to wild animals. We are also against using wild animals as pets too. 3.1. Who took the initiative to build this Property? Me, a forestry engineer specialized on ecotourism and adventure tourism. 3.2. Poverty reduction initiatives? 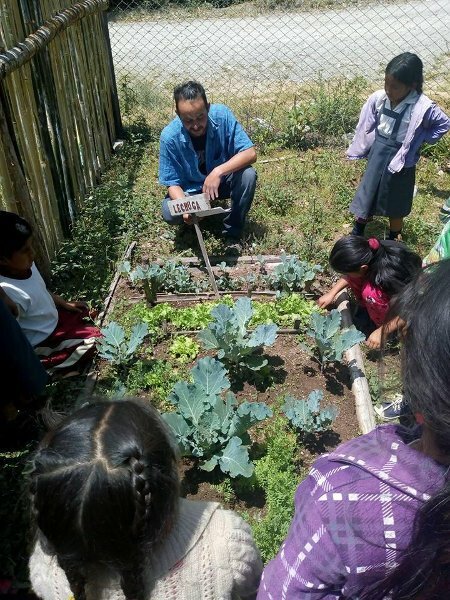 We help and work with a local school, offering environmental education classes at the primary school, working with them on a garden for vegetables, composting. We ask guests to bring us donations (school articles like books, pens, etc., clothes and medicines). At the end of each year part of our incomes are used to improve the school, including painting, garden tools, etc. We do not give money directly but we help with food, books, environmental classes and our knowledge. 3.3. Inequality reduction initiatives? We work with the local school empowering women, working with them on environmental issues, doing role plays, and natural farming. 3.4. Local purchasing policy? "Kilometre cero" concept, we buy all locally to improve the incomes of local producers and to reduce our carbon emissions for transport and logistics. We try to use only local supplies - what we can find in the local market. 3.6. Number of beds: 19. 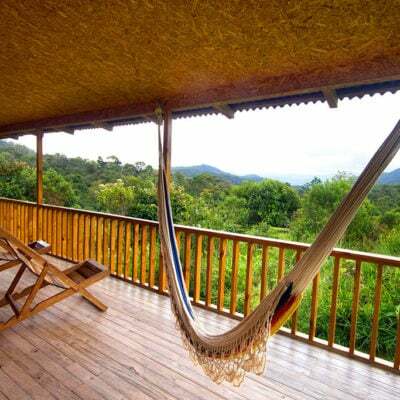 The idea is to keep it like this, so we minimize the impact on the forest and the place, and we keep it personalized. 3.7. What is the total area of the land of the Property? 49 hectares + 49 hectares State lands given for conservation for 40 years. When the 40 years pass we renew the contract for another 40 years. 3.11. How many employees are from the (nearest) local village? 5, all from Oxapampa town. 3.12. Do your employees or the community own any shares or share part of the revenue? No. 3.14. What were the total profits in 2017 and 2018? In 2017 PEN 15,120. In 2018 PEN 18,750. 3.15. How are profits distributed, and who decides about it? At the end of the year, 10% of profits are designated to buy materials for the school, prepare a Christmas activity with the school, and help the maintenance of the school including painting. 50% of profits are allocated for renovation/maintenance, 40% stay as working capital and payments for the next year. We normally stop for 3-4 months because of the rainy season when there are no guests and we need to save money for those months with no income. 3.16 Are there any national and/or local (municipal) taxes to be paid or are you exempt? Yes, national taxes. 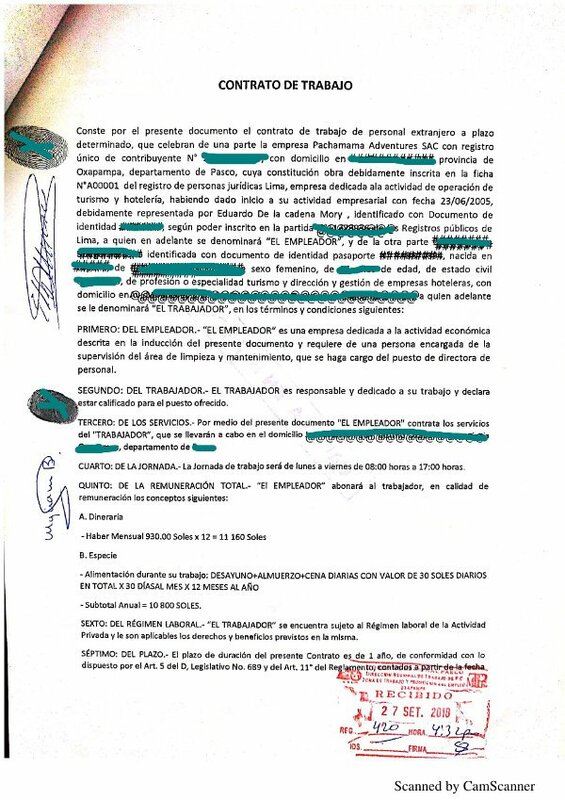 In relation to local taxes, we pay annual taxes to the municipality for the land amounting to 120 soles per year (around USD 35). 3.19. Do you cultivate food for the guests? We have a project to build a greenhouse for that this year. The greenhouse we want to build is not big, just to produce some organic tomatoes, lettuce and aromatic plants that on the local marked normally are non organic. 3.20. Do you have any agreements with local producers? Yes, we buy their coffee, which is produced naturally. We pay them more than the local market rate. 3.21. Have ever you received any funding, state, national, private or international and for what purposes? No, all income is from guests. 3.24. Are you planning to sell the property within the foreseeable future, and if so why? No, this is a life project. 3.25. If planning to sell the Property, have you explored and do you consider solutions involving the local community or members there of as owners? No selling plans. 3.26. Is the Property open all year? If not, please provide relevant dates: It is open all year, but at the moment we do not have guests all time. We open when we have reservations. 3.28. 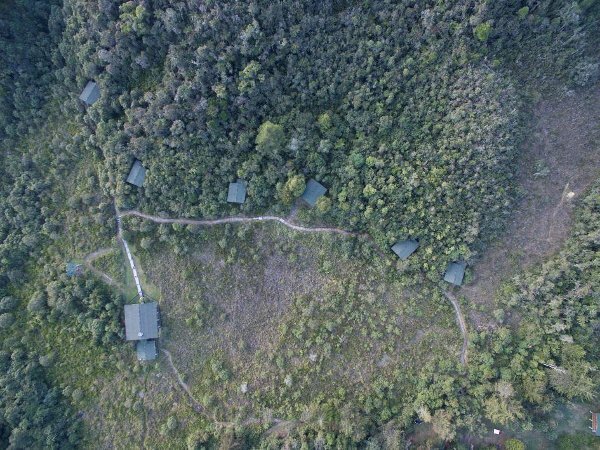 Did the (nearest) local community participate in the decision-making process concerning the founding and creation of this Lodge and how? No, it is a 15,000 people town. 3.29. Does the (nearest) local community participate in the running of the lodge and how? No. 3.30. Anything else you would like to mention in this section? We try to work with and involve local community all time, directly or indirectly, because we know that the local community is very important for conservation, they need to know the environment where they live, so they can appreciate it and take care of it. We know that conservation goes hand in hand with local economic development. We cannot only conserve the environment with love, we need to be an example that can be copied as an economic project that can fund conservation. People have to learn from our experience and understand that economic activities and environment conservation can work together. SECTION 4 – Criterion 4: “Increase Knowledge & Intercultural Understanding”. 4.1. Information and interpretation? 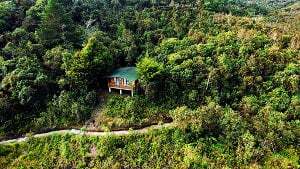 Yes we work hard on this, we give information to our guests and staff about environment, water, waste, wildlife conservation, and we have three environmental interpretation trails in the forest, about water, spectacle bear and local flora. 4.2. Cultural interactions? We bring the guests to local tours, so they can interact with local people, spend money on handcrafts, and on the local market, and know about the local culture. Oxapampa is a 150 year-old German colony. 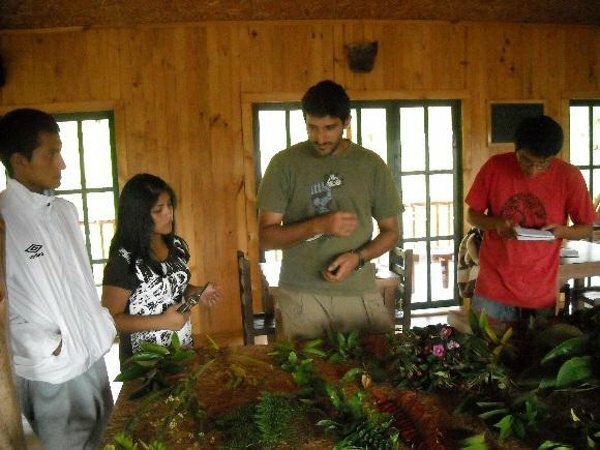 When the guests want, we take them to visit an indigenous community, one-hour's drive from the ecolodge. They get to know the place and have interaction with people too. This community is no longer like a native community, they almost live like people in the town. 4.3. Cultural Heritage Conservation? We keep food traditions, construction design, we talk with guests about the history of the colony and of native people, we try to take them to places where they can see and live part of this cultural interaction too. 4.4. Natural Heritage Conservation? We offer treks and talks about the national park Yanachaga Chemillen where I worked as director for 3 three years. We try to explain the importance of conservation to local students. 4.5. Do you encourage guests to interact with the local community and in what ways? Yes, we take them to the town so that they can interact with local people, buy local handicrafts and products like honey, handmade sausages and cheese. 4.6. What type of information is available to guests at the Property? 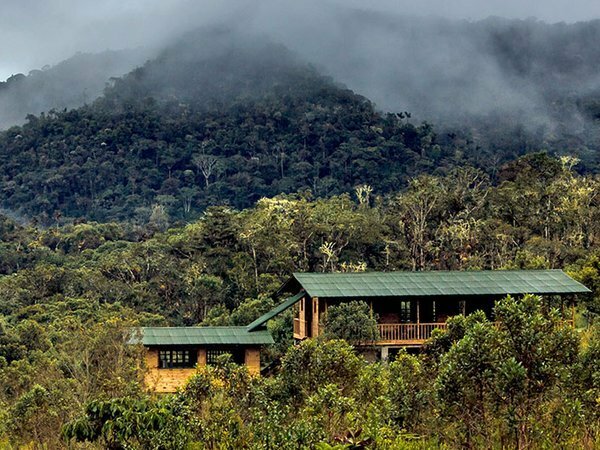 All about how an ecolodge runs, ecolodges guidelines, behaviour, how to use the resources, wildlife and cloud forest conservation, about the shampoo and soap they are using and they have to use it. Photo 4.6: Reading area for guests. 4.7. What type of activities are available to guests at the Property? 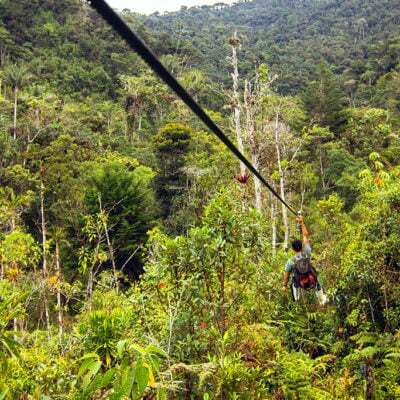 Environmental interpretation forest hikes, birdwatching, rock climbing, tree climbing, canopy zipline, night walks in the forest, forest trails, native tree planting, canyoning, national park visit. 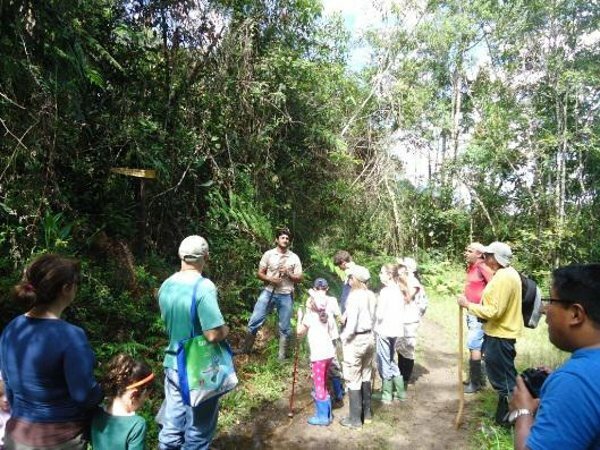 Photo 4.7.a: One of our environmental education hikes, we talk about the cloud forest conservation and water production. 4.8. Local guided tours for guests organised by you? 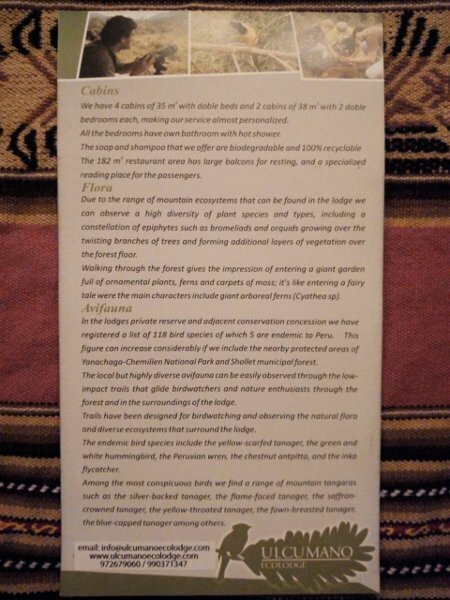 In addition to those mentioned before, please see our Interpretation Manual used by our guides. 4.9. Events/presentations held at the Property so far? We organize courses like bird or wildlife photography course, WFA courses, guiding courses. We served as headquarters for one of the national birding big days. 4.10. Is there a specific programme for children? 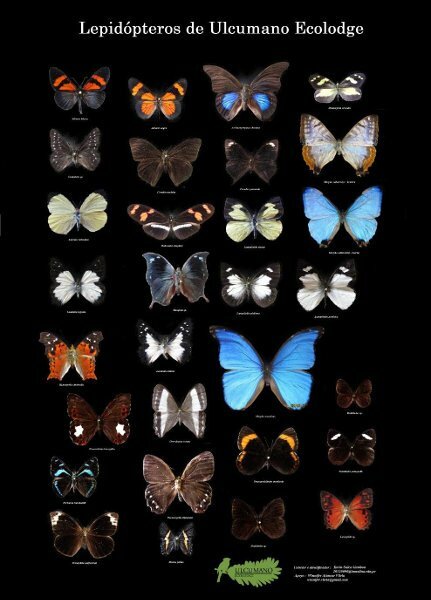 Environmental interpretation, insect watching, and tree planting. Photo 4.10: Is part of our commitment, work with children and teach them how the environment is important for all, and how they can be the change clue for our plants the next and years. 4.12. Is the local community at all involved in the operation of the Lodge and how? Almost all of the staff are from the local community.